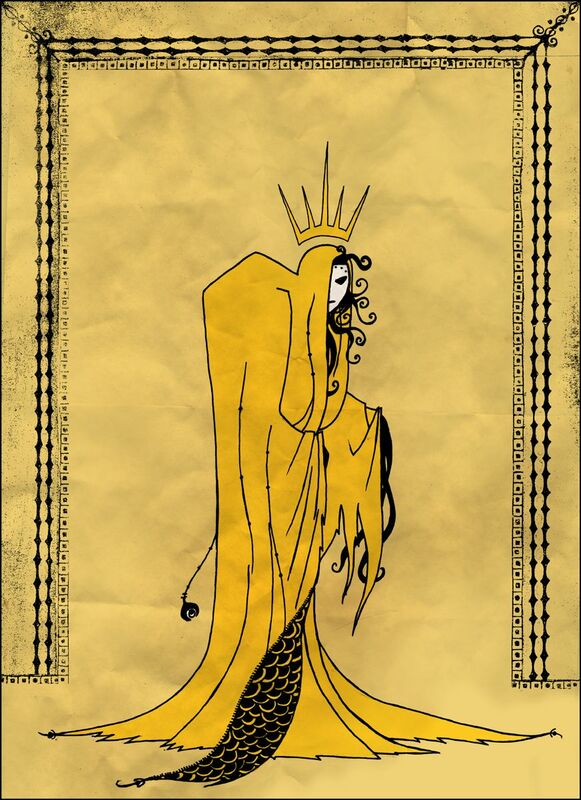 If you're into anything Cthulhu-related you've probably heard about The King in Yellow. Though Lovecraft did not create The King in Yellow, the King has since been thoroughly folded into the Cthulhu mythos, taking his place in the eldritch pantheon alongside Nyarlathotep and Azathoth. Having read through all of Lovecraft, I decided it was time I finally found out what the King in Yellow is all about. Turns out, it's a pretty good read, if not a particularly scary one. Let's start with a bit of background. Robert W. Chambers spent most of his career writing topical, popular fiction for the masses. Shopgirl romances, upper-crust scandals, thrillers, historical epics written for easy-reading and money-making, it seems Chambers was quite the James Patterson of the late Victorian era. This context, then, makes The King in Yellow even more unusual. The 4 main stories of the work are strange and soaked in madness. Later entries involve time-travel and a cycle of poetry. 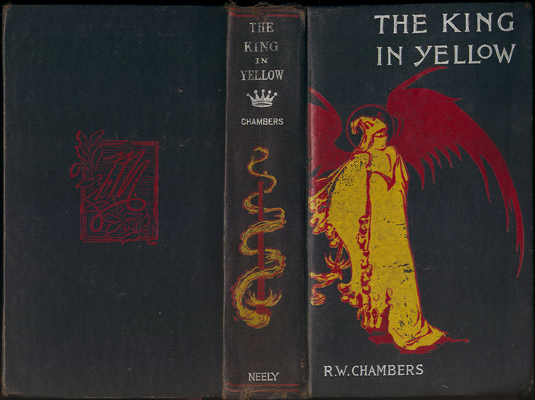 Overall, for its time and considering Chambers' previous works, The King in Yellow is far-out. I want a Pallid Mask. Sadly, though, I don't think today's audiences would think it so. Perhaps because in the past century our weird fiction has gotten extremely weird, The King is most enjoyable as a Victorian artifact. Many of the stories have plots that modern audiences would feel like they've heard a thousand times by now. For example, The Yellow Sign (possibly the most well-known story from the collection) is about a woman haunted by dreams of her impending death, and a man followed around by... wait for it... a zombie. Just one zombie. And it doesn't eat him, it just punches him in the face then kinda turns to dust at the end. The reveal of the man with the face of a "plump, white, grave worm" being dead all along was probably super creepy in 1895. Nowadays... it's not quite the stuff of nightmares. But I only talk about this to explain why so many reviews of The King in Yellow say it "isn't scary", is "boring" or "cliche", and "doesn't hold up well". Of course it doesn't hold up well! If Shakespeare was written in language closer to our modern tongue so that it lacked the exoticism of iambic pentameter and Early Modern English, we'd have people complaining all over Goodreads about how it's "so unoriginal" too! You know, because appreciating something for being original in its time is hard and involves thinky-thoughts. The rub is that when I read Lovecraft, I did get spooked. The Dunwich Horror and The Colour Out of Space in particular kept me up at night. Upon learning that Lovecraft was influenced by The King in Yellow and included bits from it in his mythos, I went in expecting to be creeped out. In all honesty, it took me a few stories to readjust my settings to be able to enjoy Chambers' book. Image much creepier than actual King in Yellow content. However, once you have your mindset straight, The King in Yellow opens up as a solid read. It's not bogged down by weighty prose like Lovecraft's tales. There are no pain-staking descriptions of sagging gambrel roofs. Though not as lively as, say, William Hope Hodgson, it's quite devourable for Victoriana. Further, the stories are really fun. The first-person protagonist in The Repairer of Reputations is BATSHIT INSANE. I genuinely would love to read a whole novel featuring that guy. The Mask runs the myth of Pygmalion backwards, with added rabbits. In the Court of the Dragon capitalizes on everything unnerving about being followed by a stranger through city streets. The ending to that one is ambiguous and a touch creepy. The Yellow Sign I described above, and rounds out the 'original collection' (I don't feel like getting into an in-depth discussion of editions here). If you follow this link to Project Gutenberg, where you can read the whole yummy text, you'll find 6 other pieces that fit the overarching theme of The King in Yellow. My personal favorites are The Prophet's Paradise and The Demoiselle D'Ys. D'Ys is your age-old Outlander-type time-travel tale, only it's all about French Falconry! So what ties such disparate stories together into a collection? What is The King in Yellow, really? It's a mythical play- a text that drives all who read it insane! Excerpts from the play are given at the beginnings of stories, and oftentimes the text will appear to tempt characters into reading it. Sometimes, as the characters tip over the brink, plunging into madness, they will recount knowledge about "Carcosa where black stars hang in the heavens; where the shadows of men's thoughts lengthen in the afternoon, when the twin suns sink into the lake of Hali; and my mind will bear for ever the memory of the Pallid Mask." Good stuff. 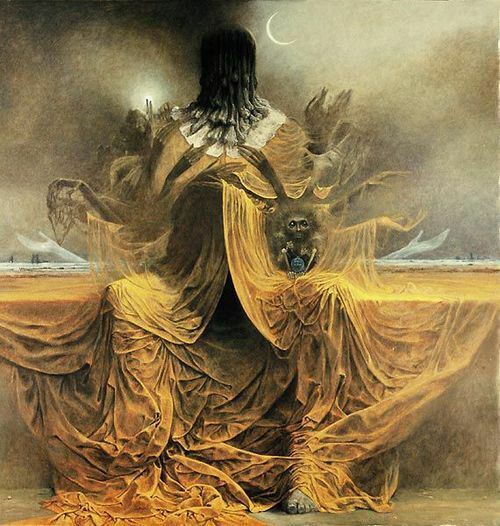 The King in Yellow, himself, is not explained in the text. Later additions to the mythos have spun him as an avatar of Hastur. He is a figure who appears in tattered yellow rags wearing the Pallid Mask. He is a mad deity to be feared and worshiped for the short time you have left. Beware the Yellow Sign! Now, I really enjoyed The King in Yellow. But this is a horror blog. Thus, if you're not sold on Chamber's book, I'd like to point you in the direction of the thing I bet you wanted The King to be all along. May I present to you my all-time favorite: SCP-701 or "The Hanged King's Tragedy." I like to think that The Hanged King is directly influenced by Salome (an Oscar Wilde play that inspired Chambers, but that's another blog post), and The King itself. And actual Carolinian plays, of course, which are their own pot o' crazy awesomeness. The SCP is really well-written, and the cherry on top is that grainy picture. I had trouble sleeping for two weeks because I kept hallucinating that thing standing in my bedroom doorway. Hope you have better luck than I did. But, I guess that's what I get for LOOKING UPON THE PALLID MASK! !